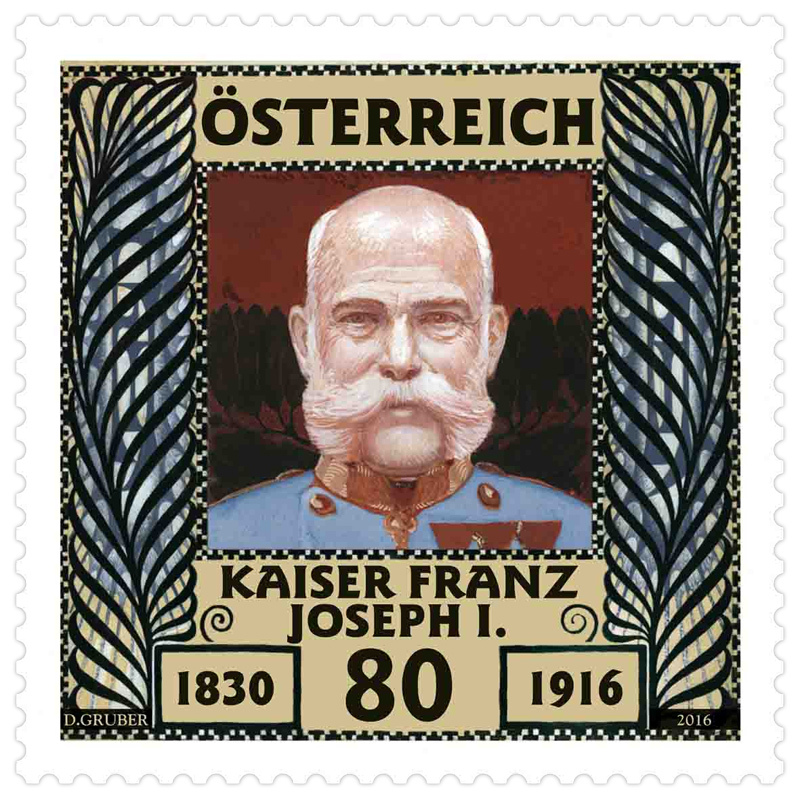 On 21st November 1916, as the First World War raged throughout Europe and beyond, the Austrian Emperor Franz Joseph I died of pneumonia in Schönbrunn Palace. He reached the age of 86 and reigned for almost 68 years. 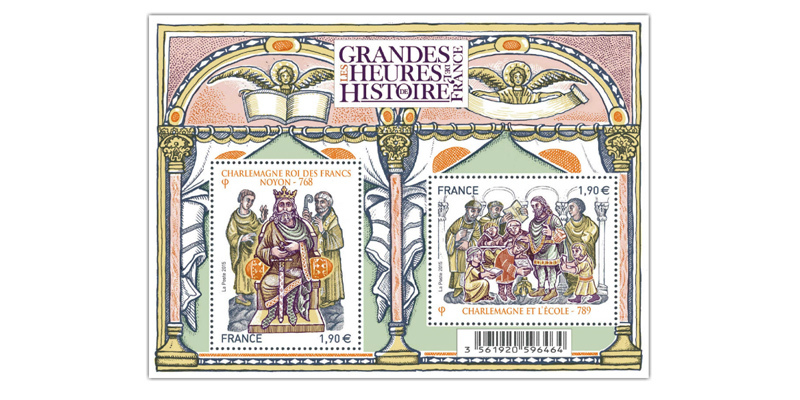 The subject for the commemorative stamp to celebrate the 100th anniversary of his death is taken from one of the jubilee stamps designed by Koloman Moser in 1908 to celebrate 60 years of the Emperor’s reign. 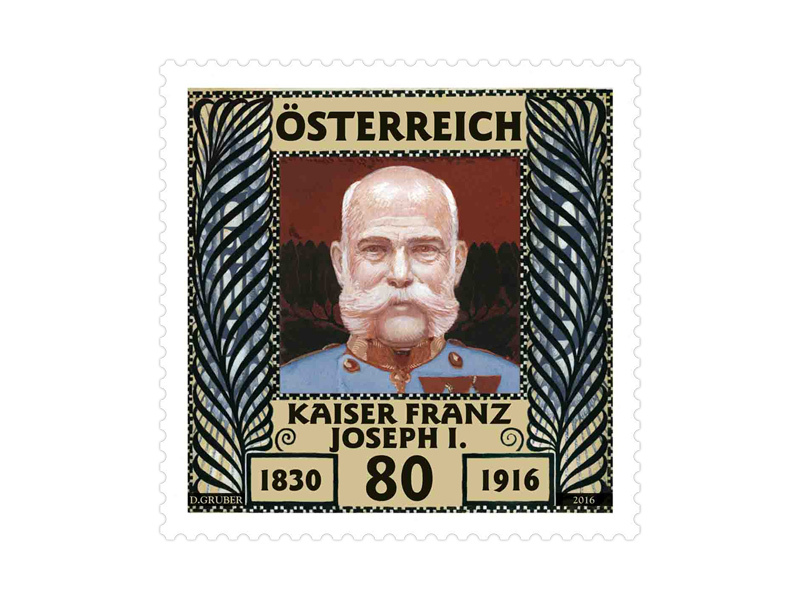 Franz Joseph was born on 18th August 1830, also in Schönbrunn Palace. During the year of revolution, 1848, his uncle, Ferdinand I, also known as “the Benign”, abdicated and the 18-year-old Franz Joseph acceded to the imperial throne. In 1854 he married his cousin, Elisabeth of Bavaria, commonly known as Sisi, of the house of Wittelsbach, who was then just 16 years old. The marriage does not appear to have been particularly happy; Elisabeth was not happy in the strict Viennese court and spent as much time as she could away from it. Franz Joseph, on the other hand, is believed to have carried on affairs lasting many years with Anna Nahowski and with the actress Katharina Schratt. The monarch suffered many cruel blows of fate: his brother Maximilian, Emperor of Mexico, was shot; the imperial couple’s son, Crown Prince Rudolf, committed suicide together with his lover, Mary Vetsera, in 1889; and Empress Elisabeth was murdered in 1898, upon which Franz Joseph is reported to have said, “Mir bleibt doch nichts erspart auf dieser Welt.” (“I am spared nothing in this world.”) His mother, Princess Sophie Friederike of Bavaria, played an important role in the life of the man who was to become Emperor “by the grace of God”. Even as a child Franz Joseph was raised and educated in readiness for his accession to the throne. He took on the position with considerable discipline and a strong sense of duty, and throughout his reign as monarch strove to hold together his multi-national state. However, he frequently failed to recognise the signs of the times until too late and failed to introduce many necessary reforms. Following the murder of the heir to the throne, Franz Ferdinand, in Sarajevo on 28th June 1914, he declared war on Serbia and so triggered the First World War, which is today considered the “primal catastrophe” of the 20th century. Irrespective of the failures of both his domestic and foreign policies, the Emperor became a legend in his lifetime, as the symbol of an age long gone. He almost always wore his uniform in order to emphasise his solidarity with the army; his external appearance with his distinctive white sideburns was impressive; he was conservative and pragmatic and was considered a stoic. Under his reign the imperial city of Vienna experienced a cultural resurgence: the ring road was built and the Jugenstil blossomed. With his death – and he worked tirelessly right up until the day he died – an era finally came to an end. Two years later, with the end of the First World War, the dual monarchy of Austria-Hungary foundered and the reign of the Hapsburg dynasty came to an end.